If you haven’t heard of Mezcal Marca Negra, you’re missing out on some amazing mezcal from some of Oaxaca’s most talented mezcaleros. 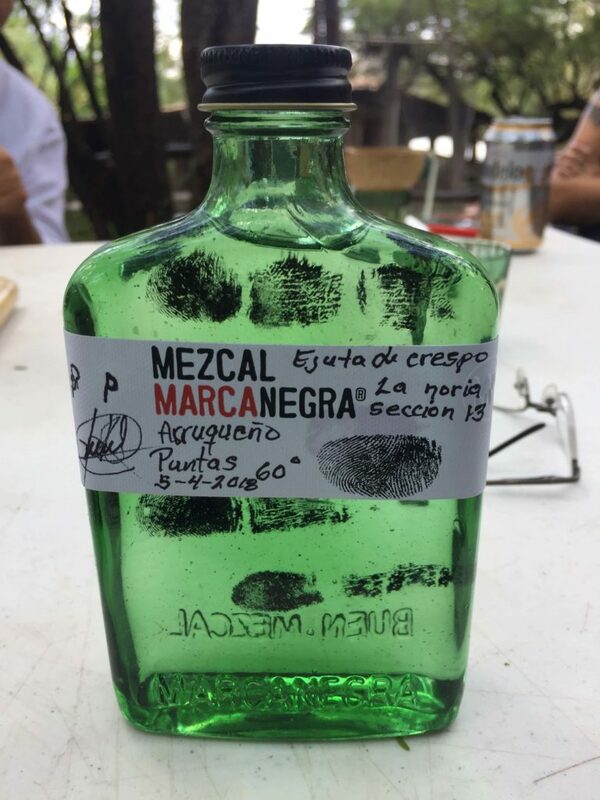 Marca Negra was founded in 2010 with the mission of promoting authentic mezcal – the brand does not shy away from releasing mezcals that are at or above 50% alcohol by volume. This might limit their audience, but the producers they work with in Oaxaca make mezcal how they like it and Marca Negra does not intervene. Batches can be as small as a couple hundred bottles to a few thousand at most. The brand is currently distributed around the world, however bottles aren’t always easy to find given the limited production. 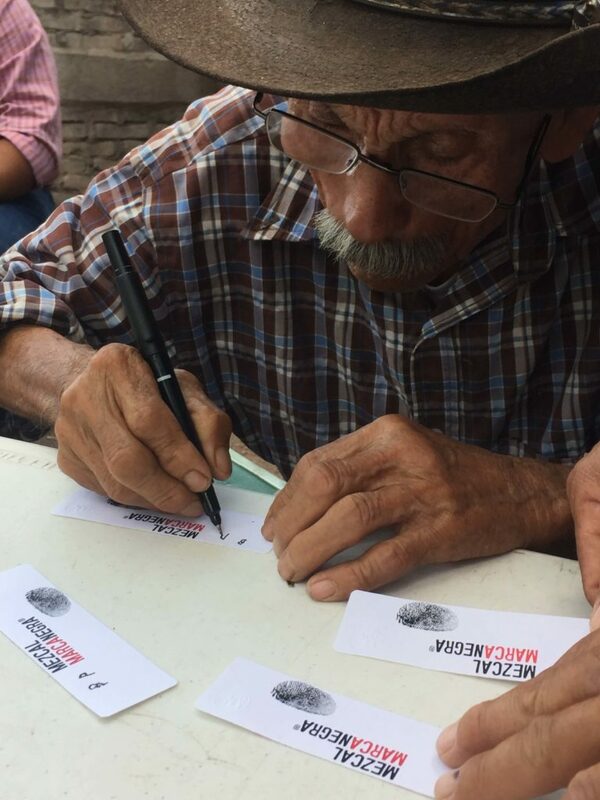 Back in 2015, Mezcal PhD shared that Good Things Are Happening at Mezcal Marca Negra. Around that time, we hadn’t yet launched this website. We first discovered Marca Negra for ourselves when Jonny picked up a bottle of their agave Espadin mezcal (from mezcalero Abel Nolasco). The bottle itself is a piece of art made of handblown aquamarine glass peppered with air bubbles. The label included the mezcalero’s signature along with batch details and the handwritten bottle number. This mezcal did not pull any punches; it was raw, slightly unrefined, yet organic and complex. The training wheels were off – this mezcal was the real deal. We didn’t know much about the brand, but as we started the site in late-2016 and began expanding our mezcal knowledge (that’s code for drinking a lot of mezcal), we realized this brand was working with some of the best mezcaleros in Oaxaca. Carlos Sada is the Global Business Development Director of Mezcal Marca Negra and his journey to mezcal is fascinating; you can hear him tell it his own words in an interview on Show de Vie w/ Mike G podcast. Last September, we met Carlos at the grand opening of Las Perlas in Austin. That evening, we arrived at a packed house and noticed a tall model pouring Marca Negra. Obviously, we made a beeline in that direction.. for the mezcal. Then, we were probably the only people in the whole bar that immediately turned away from the model to talk to Carlos who was showing someone a bottle of Marca Negra we had never seen – agave Sanmartin mezcal from Ejutla?! 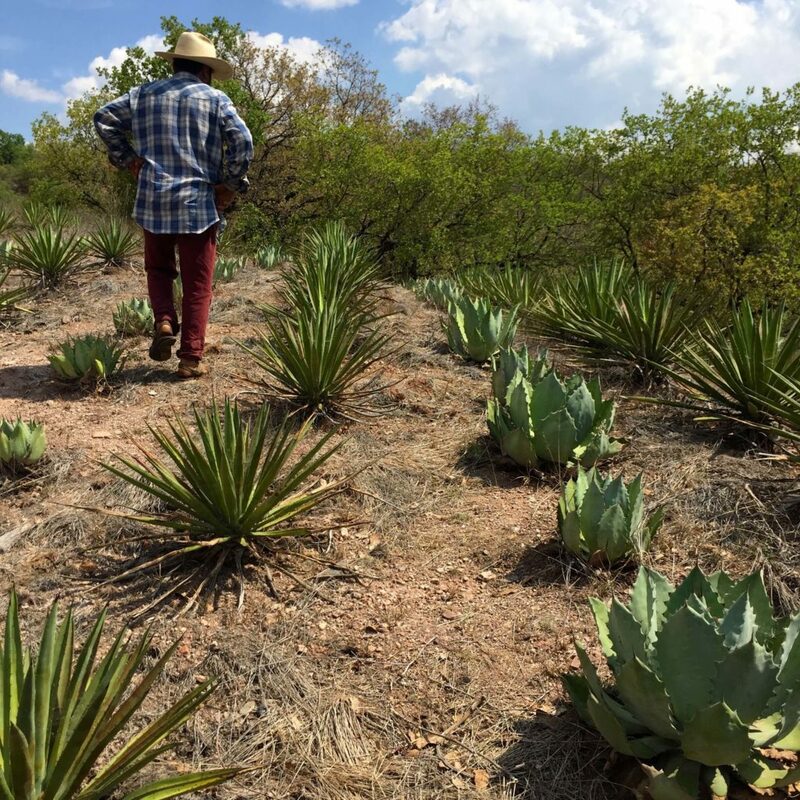 Carlos told us this was a variety of agave Karwinskii found in Ejutla – a region about 90 minutes south of Oaxaca City. 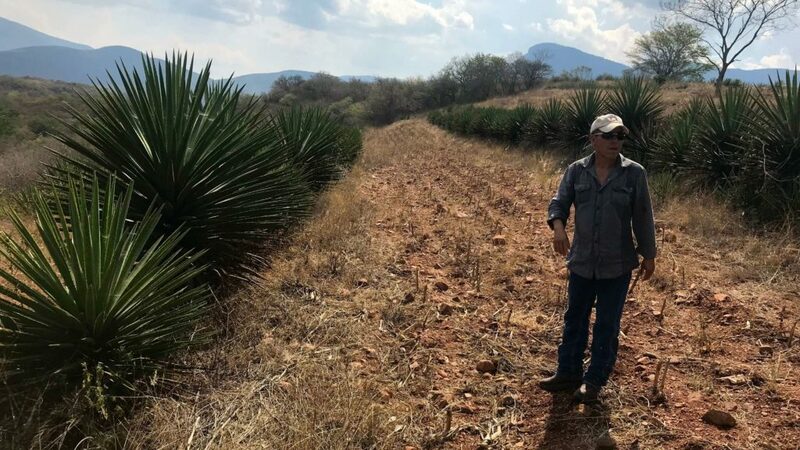 The producer, Basilio Pacheco, had also released an ensamble with agaves Espadin, Sanmartin, and Mexicano. Carlos was a highlight during the Las Perlas opening and a few weeks later, he was back to host the first ever Mezcal Collective at Las Perlas Austin – at that event we tasted through six different mezcals while listening to Carlos talk about the brand and mezcal production. The brand works with producers all over Oaxaca: Jorge Mendez in San Luis Del Rio, Don Beto in Miahuatlan, and Basilio Pacheco in Ejutla. All of the mezcals we tasted were incredible. An Instagram post from October 2017. Every mezcal fanatic knows that good mezcal is special because there is a story behind every bottle. Every bottle of Marca Negra has the signature of its maestro mezcalero – the brand made this decision very intentionally because it is a handcrafted product and a work of art. 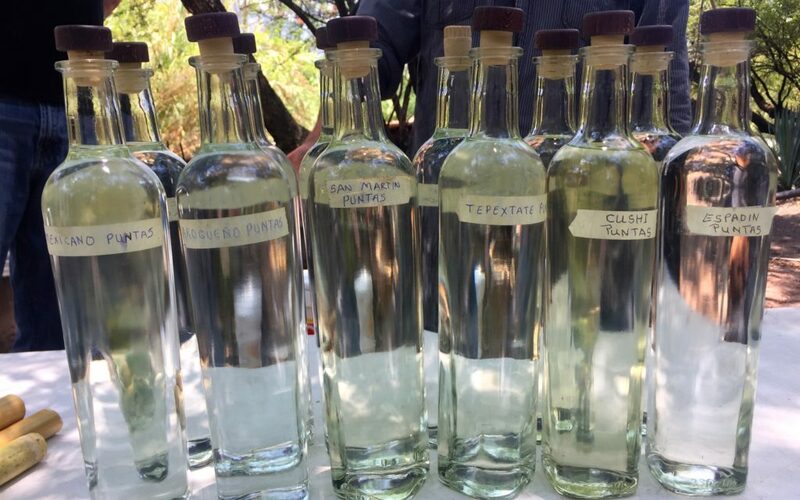 The brand aims to preserve the uniqueness of mezcal, and not promote massive production. 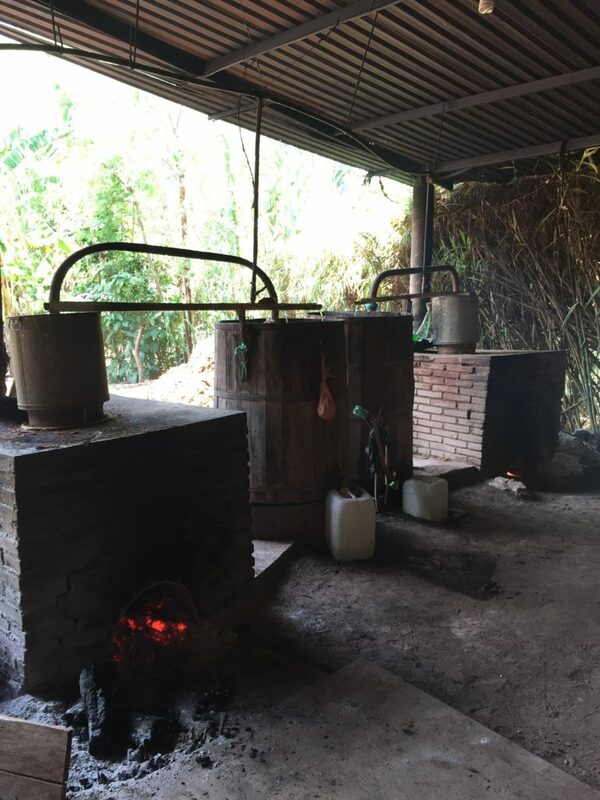 The families that Marca Negra works with have been producing mezcal in a traditional way for many generations and the brand supports their traditional methods. While this all sounds great, nothing is quite as impressive as seeing it for yourself.. so that’s what we did. Last May we were back in Oaxaca for our annual mezcal trip and had scheduled a visit to the Pacheco family palenque in Ejutla. It was a Friday, our last day in Oaxaca before leaving on a 7am flight the following morning. We were a bit exhausted from a week of mezcal research, but we had reserves left for what we anticipated being a memorable day. We left Oaxaca City that morning and headed south with Belén Salas from Mezcal Marca Negra. Belén and the small Marca Negra team are based in CDMX and she visits Oaxaca often. She had visited the Pachecos many times but was was as excited as we were about the day ahead of us. About 90 minutes into the drive, our van turned off the main road and ventured deep into hills of agaves, mostly agave Espadin and some Karwinskiis. Before we knew it, we entered a small town and approached a dirt road that had deep tracks in the mud. This would not be a great place to have the van stuck in the mud so we got out and began walking. The Pacheco family palenque was up the road and surrounded by trees in a jungle-like atmosphere. 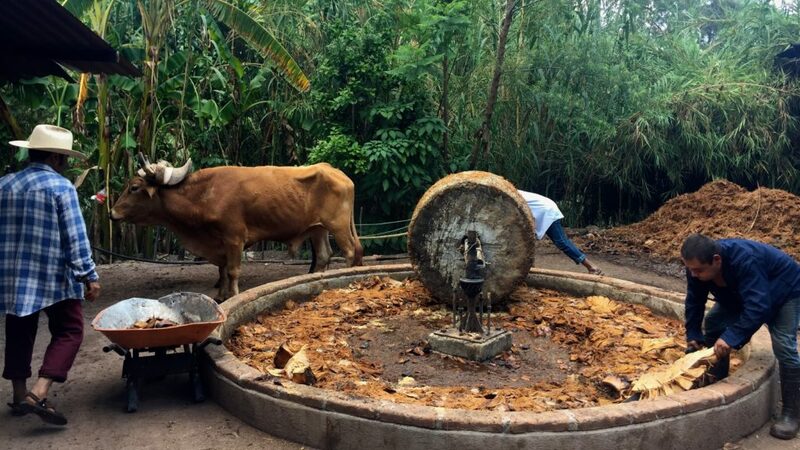 Two oxen were pulling a gigantic tahona and crushing agave. Belen announced our arrival and said hello to familiar faces. Agave Mexicano was being distilled in two side-by-side stills. Each had a second water container above the main distillation chamber as well as one around heating coils. They almost looked like refrescador still but their mezcal was double-distilled. We gathered under the shade of the palenque roof, near the piping hot stills, as the team passed along the message of our arrival. A man walked up to our group and introduced himself – this was Juan Pacheco, son of mezcalero Basilio Pacheco. 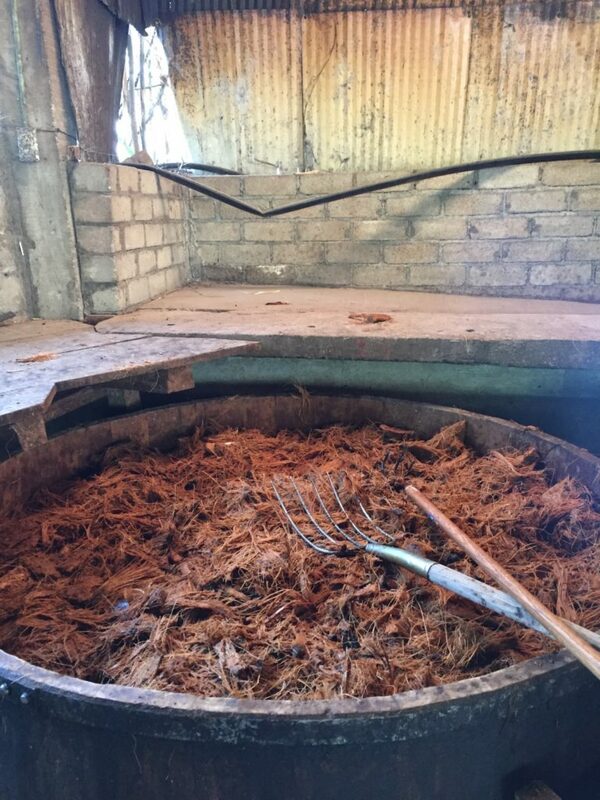 Juan offered us a taste of the agave Mexicano puntas coming off the still – we took small sips as some of the nearby crew smiled. Puntas are the “heads”, the first part of the distillation run and very high proof. Some producers completely remove the heads from the final product, others will mix the heads in with heart and occasionally the tails. Juan then showed us some of the wooden vats filled agave fibers that were dry fermenting; these were giving off warmth and he would be adding water soon. Juan was eager to talk to us about his palenque. He had lived in California for 25 years before returning to help run the family business. Juan learned how to make mezcal from his family early in life, “the day I was born, day one” as he says. His father’s initials (BP – Basilio Pacheco) are on the bottles of Marca Negra and Basilio makes the decision on the distillation cuts which result in the final product, however Juan manages the palenque, agave program, and production cycle. On top of those responsibilities, he is also the town sheriff! Juan was full of energy and excited to show us around; we quickly sipped the last drop of puntas from the jicara and followed Juan back towards the road. Up the hill from the distilling area, Juan pointed at some baby agaves growing under some netting, “agave Tepexatate”. This was surprising as we’d never seen agave Tepextate being grown from seed. After growing in the nursery they will replant them elsewhere on their land. Juan was very proud and we assured him we’d be first in line to buy some of the mezcal once the plants were full-grown and ready for harvesting… in 20 years! Nearby, some older agaves were maturing and growing quiotes. Juan explained that these were Mexicano agaves; there were three different varieties of agave Mexicano growing around the palenque. 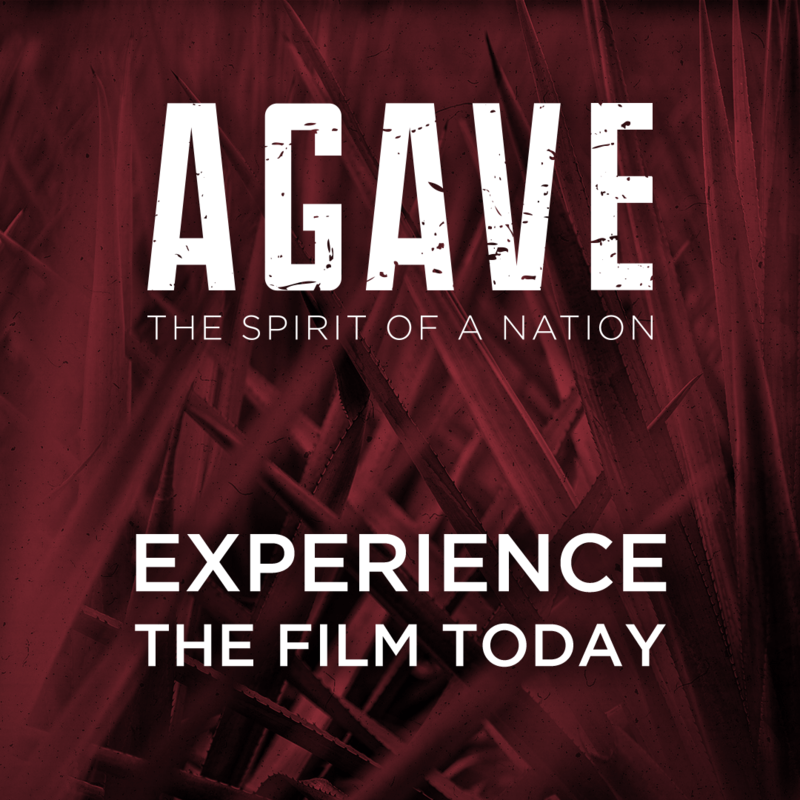 Currently, the Pacheco family uses agave Mexicano in the Marca Negra ensamble. It seemed like we had just arrived, but soon we walked back down the hill towards the palenque and 12 bottles of mezcal sat on an empty table. Guess it was time to taste some mezcal. There were 6 bottles of adjusted, “market-ready” mezcal (approximately 48% ABV): Espadin, Mexicano, Arroqueno, Tepextate, Cuishe, and Sanmartin. For each variety, they had also had a corresponding bottle of high-ABV puntas! Juan explained how the locals preferred puntas and much of the puntas leftover from their batches was sold locally. Tasting puntas next to the same adjusted batch is a real treat and helps you identify the flavor differences between straight puntas (which are approximately 60% alcohol by volume) and then the adjusted mezcal which contains different parts of the distillation mixed together and brought down to proof. Tasting puntas had been a mixed bag for us in the past. Sometimes puntas can be very dry and harsh, these had some bite but were incredibly complex and flavorful. We all were feeling pretty great at this point when Juan asked if we wanted to visit the agave fields.. of course we did. Belén got in the front seat of a truck and headed out. The four of us piled into the back of a pickup and followed behind. The caravan drove through the village and then off the main road. We climbed dirt roads into the mountains and ten minutes later we stopped to watch Juan’s team harvest an agave Espadin. The whole harvesting process for this single gigantic agave plant took nearly 10 minutes for two men wielding machetes and they are experts. Watch the video on YouTube. This agave Espadin piña weighed in at 120 kilos (264 pounds) and was taken back to the palenque in the back of another truck. As we stood atop the hillside, we seemed to be surrounded by endless agave fields. Juan’s team was using mostly clones to plant new agaves but they were allowing some of the agaves to grow quiotes and seed. He said out of hundreds of agaves only a few would occasionally become diseased or infested with insects. 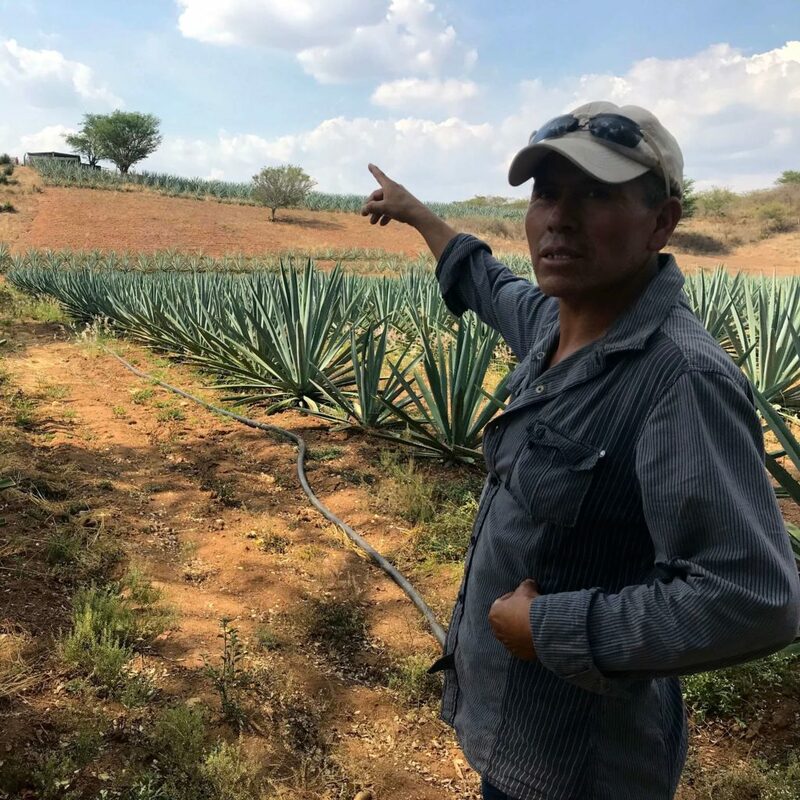 As the tequila industry knows very well, it can be dangerous to rely too heavily on clones because a single disease could wipe out an entire crop. 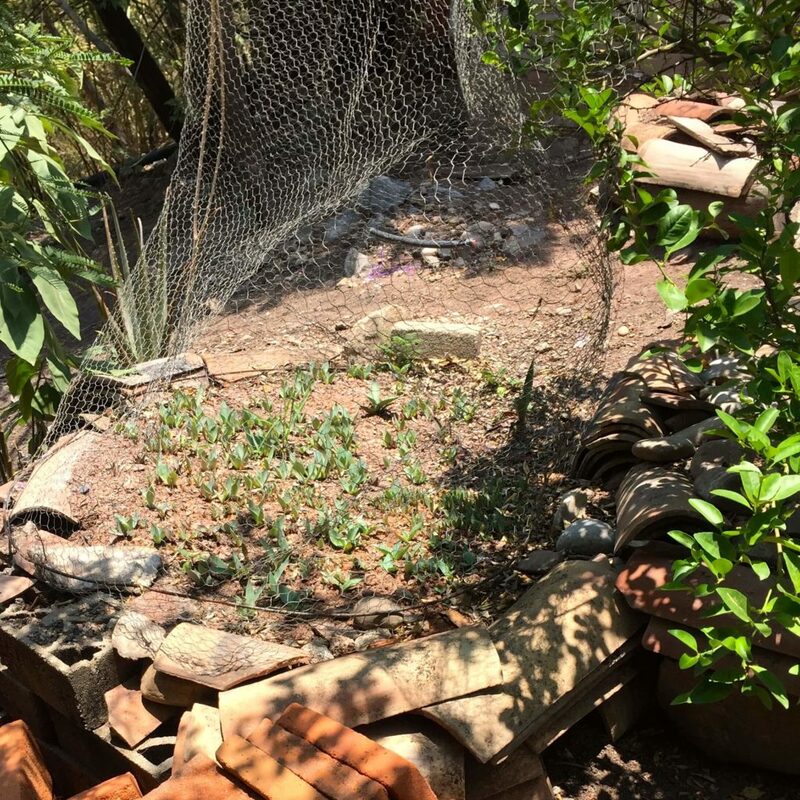 From what we could gather, it seemed like they had a program of gathering agave pups from many plants and replanting elsewhere on their land. There were wide gaps between the rows of agave Espadin where corn was grown depending on the season. Certain rows of agaves were at different stages of maturity. Juan pointed at a row of agave Espadin that were quite large for being only 4 years old. He said the red dirt soil and sunlight made them grow fast. We drove off across the landscape to another part of their property. Juan pointed up at some Sanmartin agaves which were tall and wide; this species of agave is called Karwinskii and in other regions similar looking agaves might be identified as Barril. After spending time in the agave fields we headed back to the palenque for lunch. We carried some tables and chairs from the nursery to down near the horno where the meat was cooking. Over food and more mezcal, we learned more about what Marca Negra has in the pipeline. They are working on an augmented reality project that will be used at trade shows and bartender training to transport participants to the palenques and agave fields. Next, they are revamping their official website which should we relaunching soon with new content and information. The Marca Negra team has been working with the Mendez family in San Luis del Rio since 2011. Nearly every member of the team has visited San Luis del Rio and spent time with the family. Many have seen them and their kids grow, shared parties, dinners, and other priceless memories. In 2013, Carlos and the team started Meteoro which is an agave Espadin mezcal at a price point that can be used in cocktails. Since the beginning, Meteoro has been produced by Maestro Don Petronilo Altamirano and his wife Natividad in Las Margaritas. The relationship with the Pacheco family is relatively new, but the goals are the same. Marca Negra plans to support the growth of the nursery and cultivation program beyond what currently exists in Ejutla. As our day with the Pachecos ended, we each selected a special mini-bottle of our choice to take home; the four of us each picked a different varietal (the puntas version, obviously) and said our goodbyes. To quote a famous mezcal blogger, “good things are still happening” at Marca Negra and we can’t wait to see what happens next.